Sasaki Time: Walt in DCA: Walt Disney Shows off Cars Land Model! Walt in DCA: Walt Disney Shows off Cars Land Model! In Buzz Price's book, Walt's Revolution: By The Numbers, Buzz mentions that Walt considered a second gate to Disneyland called "California Living." Clearly Walt's idea and what became Disney California Adventure were probably two entirely different ideas, but it gave me the idea of creating a series of photos of Walt in Disney California Adventure. 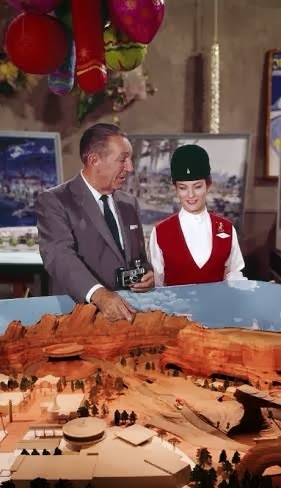 The above is a very rough image of Walt showing off Cars Land. But I wanted to give you an idea of the direction I was going. What other places in the park would Walt have taken his photo with? Please comment below any ideas you have. Comment below on what you think and if you have any ideas of where Walt would have had his photo taken. This is just meant to be a fun photo series of what photos Walt would have taken inside this park. I didn't know this.. I had no clue that Cars Land and Cars were the same lol.